Egyptian fishworkers on strike in Nea Michaniona, Northern Greece. UPDATE JAN 16: On Thursday, January 14, the case of the trawlers bosses against the strike was brought to court, and the strike was judged “illegal and abusive” (the strike was under the auspices of the private sector employees union, until the fishworkers validated their own Union during the stike by union elections – the Union was established three years ago but remained unofficial for not having undergone elections). Despite this court decision, the fishworkers will go on with their struggle and their Union has decided repeated one-day stikes for the days to come. On Thursday the protest march called by the fishworkers took place. It concluded at the Ministry located in Thessaloniki. PAME (CP’s Union) had a strong presence. Extra-parliamentary leftists and antiauthoritarians did participate but their numbers were lower than one would expect given the significance of the struggle. After the demonstration an assembly was held at the Polytechnic University and today a text was leafletted at the city’s fish market, and a poster was billed on the streets calling for an information event at the same place on next Wednesday. the lawsuit the vessel owners lodged against the strike will be brought to court tomorrow, Thursday, at 9.00. 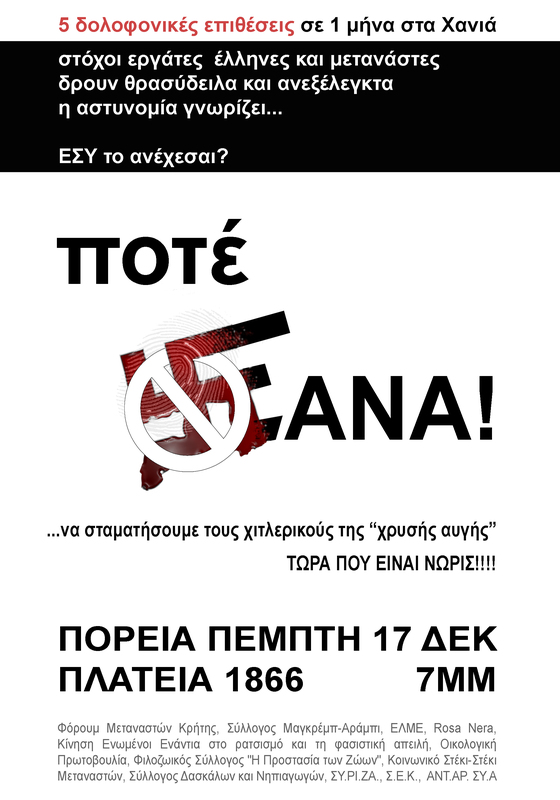 There is a call for a demonstration by the strikers and the CP controlled trade union PAME for tomorrow at 6.30, at Aristotelous sq. (Agalma Venizelou). People obviously from the anarchist / antiauthoritarian scene also call through Athens Indymedia (in Greek) for active support to the strike and the demonstration, since on Tuesday (when the case was at first to be judged) the presence of solidarity beyond CP supporters outside the courts was miniscule (a relevant call has been posted at the Thessaloniki University, and there will be a gathering for coordination after the demonstration at the Polytechnic school). Rizospastis Newspaper reported that yesterday “some vessel owners “kicked the Egyptians out” of the trawlers where they stay at night according to the treaty,and in violation of the latter’s terms manned their trawlers with scabs and sailed, ”. Yesterday Jan 11 the trial of the lawsuit the vessel owners lodged against the strike was postponed (it will take place on Thursday). Meanwhile, there have been negotiations. The employers, in cooperation with the Mayor of Michaniona and the Egyptian Embassy, along with creating an atmosphere of threats and bigotry, proposed an outrageous text as a basis for the settlement for workers demands. This text not only failed to satisfy any of the demands, but also included clauses prohibiting union organisation for the Egyptian workers, demanding the dismissal of those “misbehaving” or those “being incosistent with their obligations”. It also included a blacklist of the “troublemakers”, which had been already sent to the Embassy (one can easily understand what kind of treatment these persons – those prominently active in the struggle – will receive if deported, actually, to Egypt). They also tried to fool the Egyptians providing this text in three languages (Greek, Arabic and English) with the condition that the English is to be considered the valid one in case the translations are found not exactly matching – while the Egyptians only understand the Arabic variant. The workers clearly rejected the text. 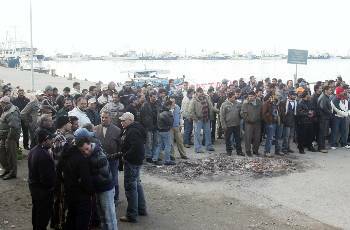 About 300 Egyptian workers at the fishing boats of Nea Michaniona (a village near Thessaloniki, Northern Greece) blockaded two days ago the small port of the village. At 19:00 today 6-7 fascists attacked the Free Social Space of Western Districts in Thessaloniki. They beat 2 people who were there. Sofia Papazoglou, a popular folk singer was attacked by members of the Golden Dawn neo-nazi party in Athens after throwing election leaflets handed to her in the garbage. The singer remains hospitalised with serious burns from use of unidentified acid spray and with impaired vision. Sofia Papazoglou, a popular folk singer of the “entehno” genre known for her progressive politics was attacked on Thursday 1st of October outside the metro station of Katehaki, in Athens, by ten members of the neo-nazi party Golden Dawn when she threw election leaflets handed to her by the thugs in the garbage. The Golden Dawn was created in the 1980s by the convicted neo-nazi bomber Mihaloliakos at the orders of the imprisoned head of the military junta of 1967-1974 Colonel Georgios Papadopoulos. Since, the Golden Dawn has been waging a campaign of terror against the left wing and anarchists as well as immigrants, people of color and jews. Nevertheless, as it comes under the explicit protection of EYP, the greek secret services (the daily eleftherotypia has published a pay-sheet of Mihaloliakos by EYP), the neo-nazi group has never been persecuted and is allowed to participate in national elections. As a clear indication of the above patron-client relation with the secret services, the election campaign booth of the neo-nazis was placed this year directly under the headquarters of the EYP, in Katehaki avenue, a few meters away from the main riot police camp of the greek capital. When Ms Papazoglou threw the racist leaflets in the bin, ten thugs attacked her with a still unidentified acid spray in the eyes and then proceeded to beat her up savagely. The police did not intervene and the folk singer was taken to hospital after the intervention of metro workers. Half an hour later the neo-nazis were dispersed by anarchist who arrived at the spot upon hearing the news of the new vicious attack. 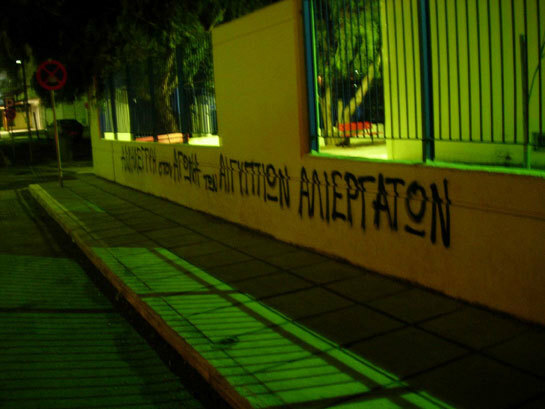 Seriously injured, an immigrant, victim of fascist violence was snatched by police from hospital, and held in parastate-controlled area of Agios Panteleimonas in a new parastate outrage. The organic cooperation of the police with fascist groups dating back to the nazi occupation has been subject to recent dizzying upgrading to the degree that the ex-chief of EYP, the Greek MI5, and the man responsible for the abduction of dozens of Pakistanis to secret interrogation camps four years ago, was appointed a leading candidate of the fascist Orthodox Alarm (LAOS) party. According to the estimations of many analysts, the intensification and arming of the fascist parastate and its open endorsement by the police are part of a state plan to create an extra-administrative force of repression and terror in the face of the rising social antagonistic movement. A victim of the continuous parastate operations of fascists and plainclothes policemen in the area of Agios Panteleimonas in Athens was snatched early this week from hospital by police forces violating doctors orders and basic rights to healthcare. The immigrant was attacked last Saturday by the usual 15-strong group of junta-nostalgic vigilantes, and had his chest pierced with an iron rod, receiving serious injuries throughout his body and head. Instead of even ordering an investigation on the assassination attempt, the greek authorities moved to arrest an eye-witness of the incident and to abduct the unfortunate immigrant from hospital. Both are now held in the notorious police department of Agios Panteleimonas which a few years ago came under protester attack after systematic torture of underage Afghan boys in its basements. The police station is a free-way for neo-nazi scum , which according to human rights groups and lawyers who have pressed charges against the police authorities, are harboured there allowed to roam through files and intervene in procedures. Lawyers have claimed that the injured man is kept in medieval conditions of hygiene and is in risk for his life. 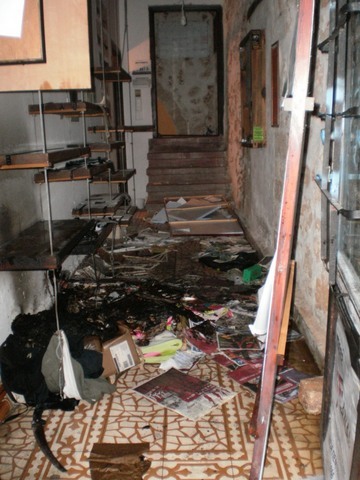 On Sunday, 13 September 2009, a cowardly group, armed with helmets and helves, attacked the Rosa Nera squat in Chania, at a time when almost all comrades were at the local antiracist festival. At the entrance of the squat they hit a mother, her student son, a friend and an immigrant and then left quickly, within 2-3 minutes, hitting one more elderly person and his son who were at that time returning to the building . During the last week posters and banners of the festival were torn across the city.